On Friday, No. 18 Chicago (20–9, 6–1 UAA) went 1–1 in their last two home games of the season. It was Senior Night and the Morgan Buerkett Memorial for the women’s volleyball team. The team honored its four current seniors, as well as a member of the senior class, Morgan Buerkett, who passed away in 2011 after her first year at the school and with the team. 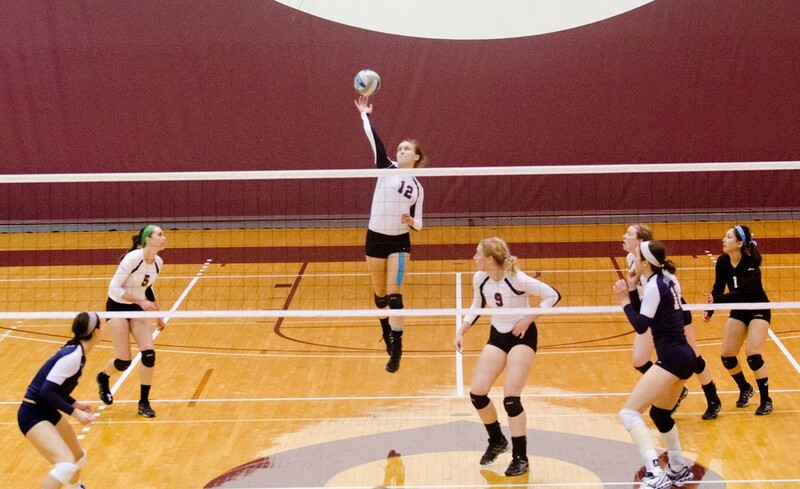 The first match on Friday took place in the afternoon against Alma College (12–13). Although Chicago won in straight sets, they did not dominate the entire match. In the first set, the Maroons never lost the lead, even though Alma surged to keep the final score within three points, 25–22. In the second set, however, Chicago won by an impressive margin of 25–15 after a few key blocks. The third set was much more competitive, as the South Siders barely held on to a 25–22 victory to close out the match. While happy with the results, the Maroons were not completely satisfied with their level of play. “We let Alma go on too many runs,” said first-year setter and right-side hitter Erin Risk. The next match of the evening came against a much stronger opponent. Chicago played No. 5 Elmhurst (27–4) and had high hopes going into the match. It was the highest attended home game this season for the volleyball team. “Everyone was very excited for the Elmhurst game because it would have been a huge win for us,” Risk said. Though the Maroons lost in straight sets, the points didn’t all fall on the same side of the net. Chicago led by as many as four points early on in the match. After tying at 11, Elmhurst pulled away and held the lead with a final score of 25–23. In the second set, the South Siders could not pick up any momentum and ended up falling short 25–13. Throughout the third set, the Bluejays and the Maroons played neck and neck. The game was tied at 16, but Elmhurst ended up winning the set, and the match, by a score of 25–22. Chicago was disappointed after their 3–0 loss. “We definitely had an opportunity to win a big regional match against a ranked opponent, and we didn’t take it,” said fourth-year setter Nikki DelZenero. In the match against Alma, Chicago collected 44 kills. Fourth-year middle blocker Maggie Vaughn led the Maroons with 12 kills. Against Elmhurst, however, the South Siders were only able to muster 28 kills. “We didn’t do as well as we could have,” DelZenero said. Coming off the loss against Elmhurst, Chicago is looking to finish its season strong at the Benedictine Tournament. “Next weekend, we need to refocus so that we can come together and play as a team,” Risk said. The Maroons kick off the Benedictine Tournament against North Central College on Friday afternoon on the road in Lisle, Illinois.